The film has been inspired by “one of the longest and bloodiest bank heists in history”, but the movie hasn’t got a lick of realism. This is Spike Lee’s Inside Man as if it traded nuance in for semi-automatic weapons. 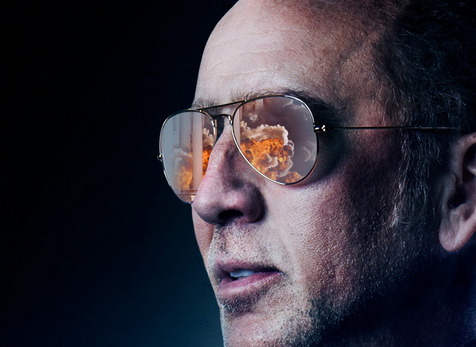 I thought it was interesting, on the Blu-ray special features, to hear 211’s star Nicolas Cage compare York Shackleton’s filmmaking to cinéma vérité – a style that could double as documentary filmmaking due to its fly-on-the-wall, authentic perspective. It’s true that Shackleton’s camera lingers in 211’s chaos, but the dynamics and dialogue are stilted to a staggering degree. The audience is constantly reminded that they’re watching a noisy, clunky action movie. If the mechanics of the movie doesn’t remind them, physical attributes will. The sets at the bank stakeout resemble a studio backlot. With all of this established, 211 still offers plenty of entertainment. Shackleton’s staging is clumsy, but the shootouts are exciting. He also sticks by his “cinéma vérité” intentions by alternating the power struggle between the police and the criminals, even going so far as to eliminate characters that were expected to play larger parts. There’s not much of an arc to Cage’s agitated police officer, but the actor does a decent job of spinning the rote role into a curious take on a nearly-retired cop who is slowly losing grip on his reality. The middle act of 211 is when the film works. As a viewer who was looking for a good time, I would rather focus on the in-between than its routine beginning and its tacked-on ending.